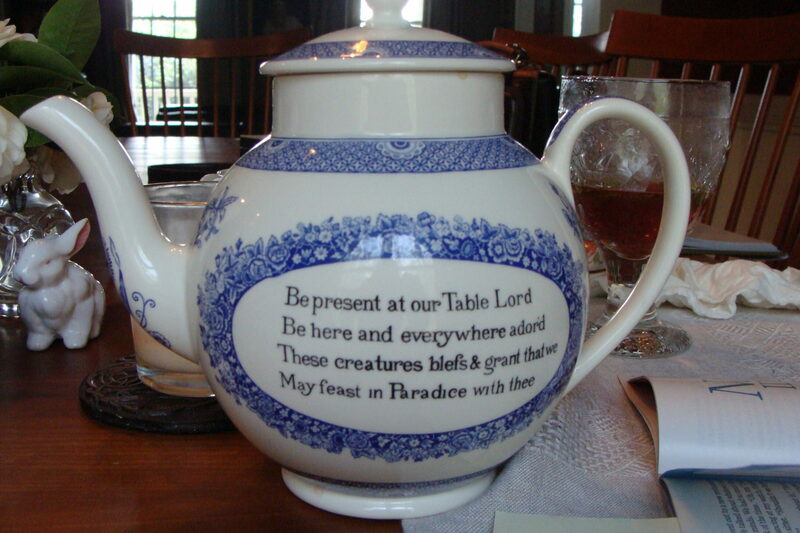 The John Wesley Teapot has two table blessings on it, one on each side. One blessing is said or sung before the meal and the second is said or sung after the meal. (Use the tune of the Doxology also called the hymn “Old 100” which is a hymn based on Psalm 100.) The prayers were written by John Cennick, an 18th century lay preacher and first published in 1740. But more because of Jesus’ love. The prayers were written by John Cennick, who was the headmaster of a charity school founded by Wesley called Kingswood School. The custom of singing thanks before and after a meal originated with the Moravians, through whom Wesley experienced his personal conversion. The teapot was first reproduced in 1908 by a woman named Anna Onstott (later nicknamed “Teapot Annie”) who engaged Wedgwood to produce reproductions that held a quart of tea. She introduced them to Methodist churches and women’s groups where they were used as outreach tools and fundraisers for missions.